Digital Seniors: You’re Never Too Old to Learn New Tech Tricks! For today’s seniors, it’s a fair bet they probably never anticipated the kind of technological explosion we have witnessed in the past 30-years. Even so, there’s no reason why they can’t be a part of the online world and digital age. In fact, there have been numerous technological breakthroughs specifically meant to help us communicate more regardless of physical distance and even mental or physical impairments. Probably one of the best parts of being tech-ready and tech-savvy is being able to communicate with your kids, grandkids and even great grandchildren more often. A lot of us lead busy lives so knowing how to send an email or a text message allows you to stay in touch as often as you want and form stronger bonds with the younger members of your family, who most likely have their noses buried in their cell phones more often than not. 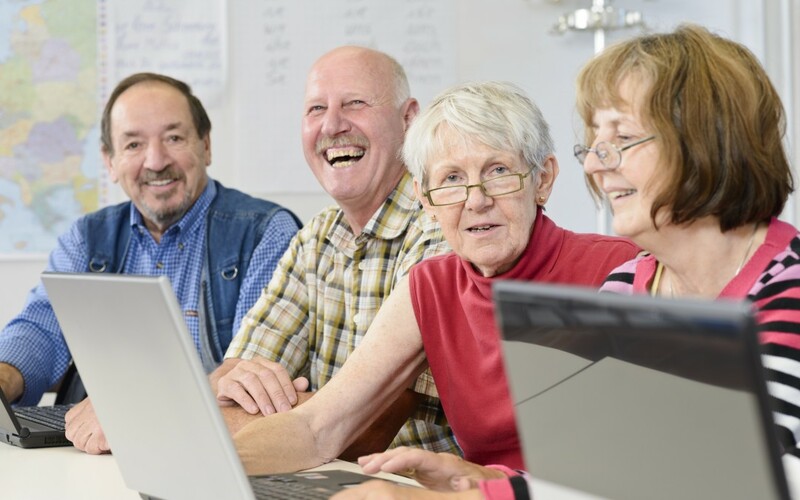 Staying socially active is such an important part of living and seniors should absolutely take advantage of the wonderful side of technology to keep in touch with friends and relatives who live out of town or overseas. Long-distance telephone calling can be quite expensive but being able to connect via email, real-time messaging systems or Skype is the cost of your monthly internet package with no geographical limits. If you’re the type of senior with something to say, have your voice heard on social media. Share your stories, life experiences and opinions with the rest of the world by going online and setting up a social media account or joining chat groups to discuss politics, recipes, health and medical information or your favourite hobby. One of the more exciting things about the internet is online dating and that definitely includes the single seniors out there! American technology advisory company iTOK released a study last year that shattered the stereotype that online dating is only for the young. In fact, 22 per cent of respondents over the age of 55 have used either the web or a mobile phone app to find love. And another 20 per cent of them say they’re game for finding romance, a casual relationship or companionship online. There are a growing number of online services geared specifically to seniors of all ages looking for just that. There’s the common saying that knowledge is power and there’s really never been a better time to learn more. The internet is full of seminars, courses, how-to-videos and tutorials of all kinds. Websites like YouTube feature free do-it-yourself type videos ranging from plumbing and painting to animal care and cake decorating. While learning new things or improving your knowledge base has never been easier, don’t forget to have some fun! Online games can be a great way to spend some time but are also a very useful tool to keep your brain active with fact recall, memory and matching and spatial recognition activities. Look for games like Trivial Pursuit, Tetris or Mahjong to give your mind a good workout. It’s also a good idea to give your body a boost with online exercise routines. As long as your doctor says it’s okay, there are thousands of internet workout programs ranging from chair-based or sitting routines to arm, leg and core targeting exercises to keep seniors fit. You’ll also find a wealth of stretching and meditation videos to stay nimble and feeling positive and tranquil. The Nintendo Wii also has sports games created just for seniors who want to stay active or increase their fitness levels. When it comes to cell phones, there are specialized phones with larger number pads and smartphone settings to enlarge font size on the screen for easier reading and manoeuvring. There are also smartphone apps that can help you stay organized and on track like getting medication alerts which can be very handy if you’re taking multiple pills. Such apps can prevent a medicine mix-up or missing doses. We occasionally hear stories in the news about an elderly person going missing because they wandered off from their home. GPS tracking devices in mobile phones can be a very handy tool to have in your Alzheimer’s care or dementia care arsenal. And lastly, in the case of home care, being able to send a text message to a relative or your personal support worker can be a convenient way to give them a quick update on how you’re doing or if you need them to pick-up something before their visit like flowers or a sweet treat.